Silverfish cause expensive and annoying damage to property due to their nightly feeding habits. They eat away at tapestries, wallpaper, carpet, fabrics, photos, books, clothing… Whilst silverfish are not harmful to humans they are often first seen when large numbers are present or the damage has already been uncovered. 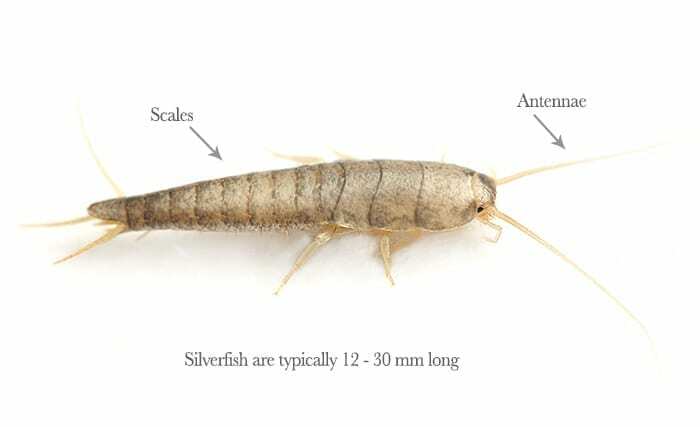 Silverfish are commonly found in kitchens, bathrooms, laundries and sinks. To prevent them entering in the first instance, be sure to seal cracks and crevices and ventilate high moisture living zones. Avoid introducing Silverfish into homes and businesses by checking for signs of Silverfish before transporting cardboard boxes inside. Ensure to vacuum regularly reaching into the corners where the carpet meets the skirting boards. Keep food sealed in airtight containers, remove piles of unwanted paper and keep high humidity zones well ventilated. Where Silverfish are present in large numbers or valuable edible items are present, it is recommended to seek expert Silverfish control. This will ensure eradication and effective strategies can be employed for ongoing protection.